Russell Alger was born near Medina, Ohio on February 27, 1836. He was orphaned at age 12 and then spent 7 years as a farm hand while also completing his education. He studied law in Akron, Ohio and at Hillsdale College in Michigan and was admitted to the Ohio bar in 1859 after several years of teaching school. In 1860 he moved to Grand Rapids but joined the Union army the next year. Serving with General Phil Sheridan for much of the war, he fought in 66 battles of skirmishes and rose to the rank of brevetted brigadier general. When he returned to Michigan, he moved to Detroit and entered the lumber business. I believe that he began by shipping lumber and acting as a wholesaler. Eventually, he began to purchase northern Michigan pine forests for their timber. His firm eventually controlled more than 100,000 acres close to Lake Huron. Until fields were drained and tiled, much of rural Michigan was swampy during the spring and summer. This meant that timber not located near water could only be cut in the winter. After felling huge trees, you had to drag them to a sawmill using a team of horses or oxen but this was not possible if much of the route was swampy. Frozen land was required to get the huge logs to the mill. Alger helped to develop narrow gauge rail lines that could be easily put in place and then ripped up after the timber was cut. This system depended upon the inventionin Michiganof the Shay steam engineone that could operate on lightly constructed rail yet was strong enough to draw several heavy cars of logs. Alger became extremely prosperous and, by the 1880s, played a key role in the finances and leadership of the Michigan Republican Party. He was the successful candidate for governor in the 1884 election. His contributions and efforts extended to the national Republic Party and, in 1895; President McKinley selected him to serve as Secretary of War during this key period surrounding the War with Spain. Alger superintended sending troops to maintain US control of Cuba, Puerto Rico and the Philippines after the Spanish surrendered. However, Alger was criticized for his poor financial management of the Department of War, so President McKinley replaced him in 1899. Alger returned to Detroit and, in 1902, was appointed to the US Senate by the state legislature where he served until his death in 1907. His son who inherited much of his fortune built the magnificent Russell A. Alger lakefront home at 32 Lake Shore Drive in Grosse Point Farms that now serves as the Grosse Point War Memorial. 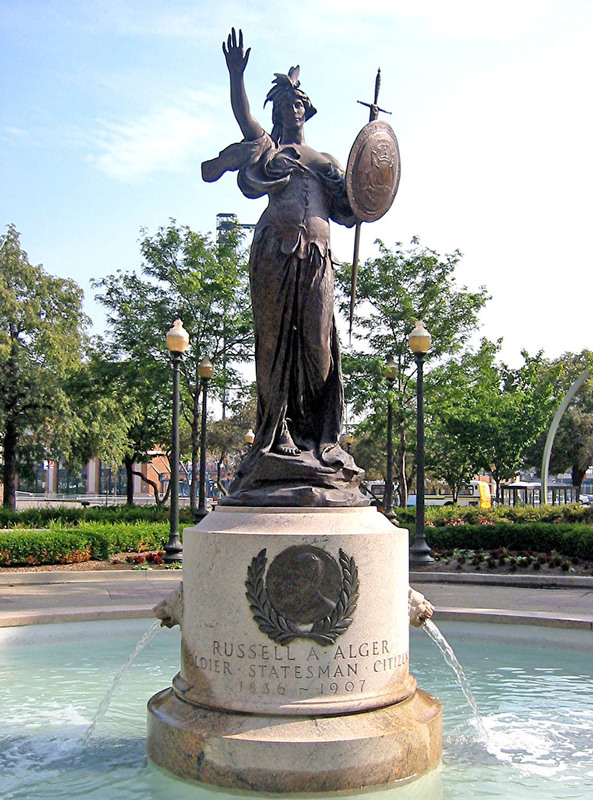 The strikingly attractive Alger Memorial Fountain in Grand Circus Park was designed by one of the nation's leading sculptors of that era; Daniel Chester French. The pedestal shows Alger surrounded by laurel. Then there is the beautiful classical style statue representing the State of Michigan that Alger served for more than 20 years. She wears a crown of laurel. Her right arm is firmly raised in greeting but her left hand holds both a sword and a shield that displays the Great Seal of the State of Michigan. Is this the way your think of the State? The sculptor uses a very attractive and classical depiction of a womanwith right breast baredto represent Michigan. The sculptor, Daniel French, is perhaps best known for his collaboration with Henry Bacon on the design of the Lincoln Memorial in Washington.